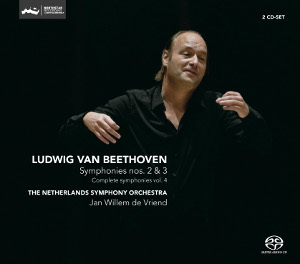 Astonishing as it may seem, this Beethoven symphony cycle from Jan Willem de Vriend and the Netherlands Symphony Orchestra has a niche in the market almost to itself. With the notable exception of Jos van Immerseel's ongoing cycle, this is the only one available on SACD and played on period instruments. If your dead set on that combination of attributes, it may be worth considering, but otherwise this is very much middle of the road Beethoven with few artistic merits to elevate it above the hundreds of others available. de Vriend takes A lively approach to this music, and there is a palpable sense of energy in every phrase. This is just as well, as his speeds, at least for period instrument performance, tend to be on the steady side, with the Scherzo of the Second Symphony in particular weighed down by surprisingly slow tempo choices. But a more serious failing, at least to my ears, is the conductor's unwillingness to bring a distinctive character to each of the individual sections. So the move from the Adagio introduction to the Allegro exposition in the opening movement of the Second, for example, has no real contrast and no sense of surprise. Similarly with the Eroica, a piece that comes with many interpretive expectations, none of which are seriously challenged here. Beethoven's dynamics, hairpins and accents are faithfully reproduced, in fact they are often exaggerated, but this is the only way in which the phrase structure is articulated. So those punch chords from the brass in the opening movements of both symphonies are driven home, but there is little nuance or shaping in the quieter phrases that follow. All of which is a shame, because the orchestral playing is generally very good. The Netherlands Symphony Orchestra apparently use modern instruments for more recent repertoire and period instruments for Classical-era works. That sounds to me like an improbable scenario, and I suspect there is a little of both going on here. Certainly, the calf-skin timpani give a 'period' feel, as do the narrow-bore brass instruments. But the overall impression is of a big, brash symphony orchestra with a few period touches added. Given the isolationist politics that has characterised period instrument performance for decades, the conciliatory approach of this ensemble may offer a potential route out of the seemingly intractable division between ancient and modern. But the orchestra does not find a middle way so much as mix elements of the two performing traditions without really offering the best of either. But of course, all these impressions come through comparison with the many other versions of these works on the market, and the recording could be considered to have merits on its own terms. The Challenge Classics team go for an atmospheric but clean sound for their SACD reproduction. The strings and woodwind could do with a little more definition, but the engineers don't give them the help they need in this respect. There is nothing actually wrong with anything about this recording, and as I say, the energy and life that de Vriend injects, especially in the outer movements, makes for engaging listening. But if you listen to these and then put on the Chailly or Gardiner you'll realise just how much you're missing.